Some situations call for cool light, others benefit from the ambiance of a warm cozy glow. With this desk lamp, you can have different settings from just one bulb. One simple touch lets you toggle between 3 color modes (2800K-6000K) and 7 brightness levels to suit whatever you’re doing. With its advanced dimmer and memory function, the LED lamp can memorize your last setting automatically so that you can save yourself the hassle of having to adjust every time when turning on. Say goodbye to glare and that inevitable headache you are bound to get when you stay on a task for too long. A new-generation LED module generates a soft adjustable light that evenly spreads onto the work surface, ensuring great visual comfort while helping to reduce eye strain. 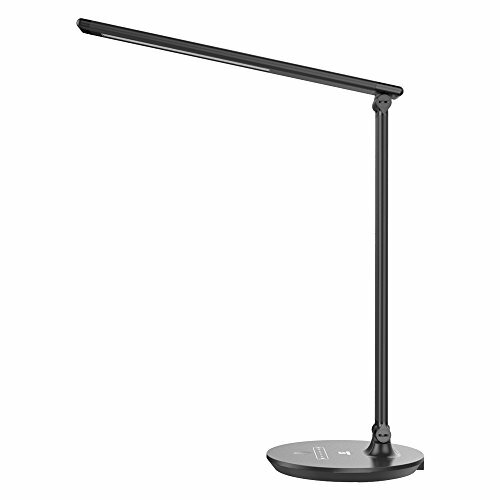 The core of the TaoTronics lamp lies in its flexibility. The pivoting head swivels 180o, and the flexible arm adjusts up to 90o, so you won't have to bend awkwardly to get your lighting focused correctly on your workspace. The arm also folds in towards the pole, allowing it to easily fit in any tight space. Built to impress, this metallic lamp is sleek and functional with an energy-efficient LED technology held in place by a sturdy steel base so it doesn’t topple over easily.